Ocean Breeze West, the affordable condo rentals directly on the gulf, is perfect for those who enjoy small complexes. The building has 47 units with a Gulf Front swimming pool and a large sundeck. Ocean Breeze West is located on 200 feet of beachfront but also has a large expanse of vacant beachfront to the east and to the west, so you can claim your own space! 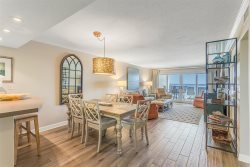 Ocean Breeze has two bedrooms, two bath and three bedrooms, two bath condos available with large beachfront balconies from the living room and master bedroom. Walking distance to Lillian's Pizza and the Shrimp Basket and convenient to shopping and attractions.